Knowing how to do scuba diving is not difficult, but as with any activity worth working with, it takes some time and effort. During the PADI course (Open Water Diver), you will enjoy three stages: Knowledge Development, Pool Scuba Diving and Scuba Diving in Open Seas. At the Salt Water Diving Center PADI there are small groups of trainees (3-6 people) so that we are in close contact with the trainee and to be thoroughly informed about each one's deficiencies or abilities. We insist on meticulous learning and the compliance with the security rules which are both essential for our next steps on the seabed. We make learners aware of the fact that not only can the violation of the rules play a decisive role for their lives but it can also threat the life of whoever has dived with them. We learn to respect the seabed and not to be afraid of it. The PADI Open Water Diver course is incredibly flexible and performance-based which means that the PADI Diving Center has the ability to offer you a program through a wide range of programs and proceed according to your own pace. 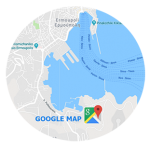 It is possible to complete diving in confined water (swimming pool) and open water conditions (sea) in just three or four days (provided that you have read materials and watched the video in time). However, many people prefer a more relaxed program. 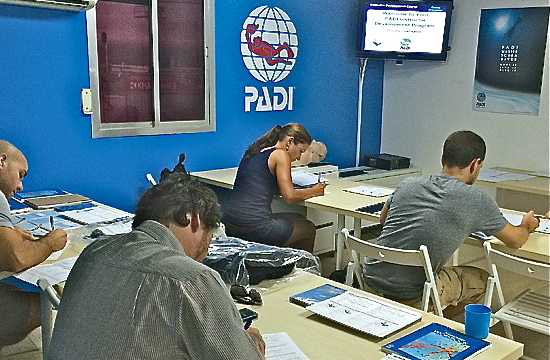 Visit the Salt Water Diving Center PADI to learn about the programs or ask for a private or semi-private course. This concerns the development of your degree of familiarity with basic principles and procedures. For example, you learn how pressure affects your body, how to choose the best type of equipment and what to look into each time you plan scuba diving. Complete knowledge development yourself by studying each of the five sections of the PADI Open Sea Diver Manual and following the corresponding section on the PADI Open Sea Diver Video (which also includes a preliminary test of the skills you will develop). If you like learning through a computer, you can also purchase the PADI Open Sea Diver Manual along with Video in CD-ROM format. Revise what you have studied in each section with your instructor and answer a short questionnaire to make sure you have understood the materials. At the end of the course, a test follows to ensure that you have established all of the key concepts and the objectives of the course. This really has to do with diving. Develop basic dive skills in a swimming pool or in a water area with swimming pool conditions. Here you will learn everything from fitting the equipment to how to empty the mask out of the water without climbing the surface. You will also practice some skills required in an emergency, such as air distribution - in case of danger. In addition, you can play some games, make new friends and have great fun. There are five dives in pool conditions and each one is based on the previous one. During these five dives, you acquire the skills necessary to dive in the open sea. 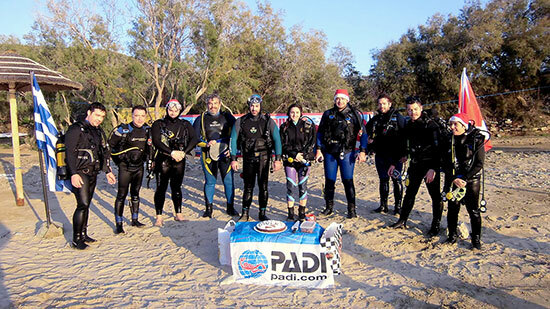 you and your new friends continue training during four open sea dives with the PADI instructor in the diving area. and you fully experience the underwater adventure - at the beginner's level, of course. You can take these dives close to the area where you live or to a more exotic destination by taking a vacation break.